Items that have not previously been made available via Chris's Acorns are marked new. Early access to Acorn's new technology, the ability to order pre-production prototype hardware and specification documents. Early access to Acorn's new software, beta versions. Significant discounts off the RRP of Acorn products. Email and telephone support from Acorn engineers. All files are in .ADF disc image format. In the archive is a mirror of the FTP site for registered developers from September 1998, at the time of the closure of Acorn's Workstation Division. It contains many interesting historical items, here are some highlights. 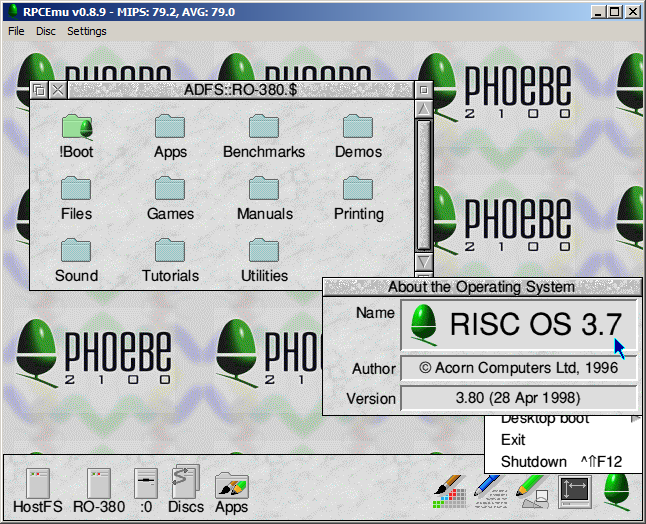 As part of the development of the Phoebe Risc PC2 Acorn developed a new version of the OS, RISC OS 4. However they made an early version (retronymed to 3.80) available to the registered developers. It contained many of the advances that weren't directly related to the Phoebe hardware. It had a much improved (though buggy, see below) file-system. It also featured the first major graphical overhaul of the GUI since RISC OS 3 came out. 3.80 as released to developers does not work on a StrongARM, only ARM610/710 and the A7000/A7000+. However an Acorn internal StrongARM compatible ROM image is available from this site. RISC OS 4 was finished off and released for Risc PC users by RISCOS Ltd in 1999. Also check the readme.txt and knownbugs.txt. Important note: RISC OS 3.80 has a known data-loss bug in the new file-system, it therefore is not a good OS to trust with your data or use long term. However it does have a historical relevance as the last version of RISC OS Acorn released (even if not publicly). As part of the StrongARM development the new OS was made available to developers to test their programs. Of course this was before most had StrongARM processors so you could only test non-ARMv4 issues. This soft-load works over the top of RISC OS 3.50 and 3.60. Check out the ReadMe.txt for details. Dave Walker, Engineering Support Manager (later Developer Support Specialist) at Acorn, would email regular missives out to developers with details of the latest news, downloads and support. Here are some highlights. 22/01/1997 - Risc PC 2 (Phoebe) development noted. 13/10/1997 - RISC OS is Y2K compliant. 03/04/1998 - Acorn tries to relaunch the Acornsoft brand. 24/04/1998 - Schedule for the 5th May developer conference. 08/06/1998 - Preliminary guidelines for developing for the Phoebe/Risc PC 2. 25/06/1998 - Dave explains the new management changes with Stan Boland as the new CEO. 04/09/1998 - RISC OS 3.80 soft-loadable OS made available. 15/09/1998 - The last entry on the mailing list, Phoebe (Risc PC 2) powered up and so close to production. Two days later the project is cancelled. API Documentation - Before it was rolled into the next Programmers Reference Manual. Appnotes - Some of the later Acorn Application Notes. Field Change Orders - Recommended hardware changes for many Acorn machines. Price list - How much, or little, did a developer pay? Example code - How to write a file-system, a browser plugin, use the nested WIMP and more. 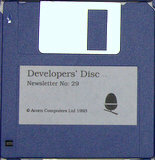 Risc PC J233 disc - The disc archives of Acorn's last released machine. Hardware Test - Hardware test programs for most Acorn 32 bit machines, be careful, may format your hard disc! NC documents - Documents about Acorn's Network Computers. NC Boot system for Unix - Boot you Network Computers from a UNIX server. Updates - Updates for many previously released Acorn programs. Two CDROMs that were made available to registered developers are available on the CDROMs page, including beta test, utility and support programs. A copy of the handouts given to registered developers at the August 1997 developer conference is online. Including information on Phoebe and Galileo. I am sure there is a lot of other material related to the Registered Developers that hasn't yet come to light. Do you have copies? Please get in contact! I am looking for files, documents, price lists and anything else that may be relevant.